Why are we going to the Wild Goose Festival? A practice on Sacramental living. The “we” is because Ricci and I will make the pilgrimage together to the Wild Goose Festival, June 23-26. We have decided that this pilgrimage will be our 11th wedding anniversary gift to each other. We are very aware that it will not be the perfect gathering of people that will solve the entire cadre world’s problems and bring ultimate cosmic transformation, where candy cotton flowers will bloom and angels will be putting us to sleep with holy lullabies. But because we know the Sacred have this way of seeping through the crevices of our broken humanity and ill treated nature, we’ll be wide-eyed looking for bright manifestations of joy and hope. We are going because for us it would be a practice in sacramental living. What do I mean by that? I mean that we in our specific places live in a dialectical relationship with the immanent and the transcendent presence of God. God’s grace allows our finite embodiment, in the particularity of place, to enter into the unfathomable reality of God’s life in this world. God’s intervention, the Incarnation, evokes a historical reality. It testifies to a concrete expression of some new way of living in the world. Therefore, gatherings in place and space, like Wild Goose Festival, are holy places where the Sacred is present and can be encountered. Because of the reality of Creation and Incarnation humans are able to bring a sense of transformation that honors “placeness” in the world. In the light of such reality human response must not be a private one, but one that intervenes and makes public God’s presence in the world. With this understanding, human activities and relationships in particular localities have the blessed opportunity to be sacraments pointing to God’s loving relationship and activity in the world. Therefore, for Ricci and I, the Festival can be a humble and fragile but vibrant sacrament of God-space (a.k.a. God’s Kingdom). 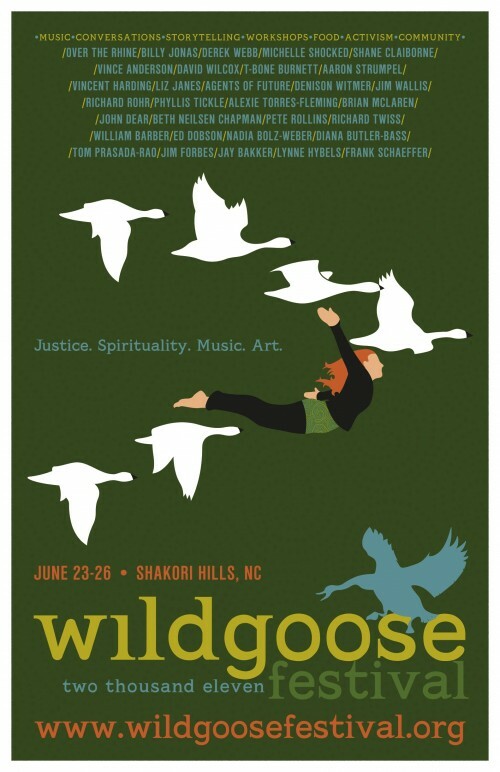 At the Wild Goose we will join others in dreaming up and cracking open new neuro-pathways that will help us imagine “what if…” Aware of own limitations and brokenness, we would take serious the sacramentality of presence and space; and dare for sometime break the ground, plant seeds and humbly cultivate a liberate space. To cultivate is an intentional act: the seeds are not just thrown around, and the gardener live in hope that choreography between action (ploughing, planting, watering, feeding with compost, pruning, etc) and hope would bring delicious fruit. And then back to cultivating again. I believe our time at Wild Goose in less than 2 months will be a large apprenticeship gathering, not that we have already arrived, but a sacramental space to learn crafts and experience new movements to keep cultivating the soul, nature and communities. THe following quotes (from different posts, arranged by me to make the point) is from another blog on sacramental living, Life Giving Spring (http://lifegivingspring.info/LGS/about/) and examines it from an orthodox/Ancient Faith) point of view: ‘Elimination of all non-human Creation from the Kingdom of Heaven has also distorted Christian anthropocentic understanding of humanity as “crown of Creation” from one of responsiblity rooted in Divine Image of self-emptying humility to one of ungodly arrogance that tyrannizes and terrorizes all Creation’. ‘Ancient Faith is theologically centered in types of Divine Image, or icon as represented in its sacred art, iconography. By comparison, theological types deviating from Divine Image are evident in imagery of Western European Romanism,…’and these deviiations ‘…in turn gave rise to Protestant reaction from within Rome’s Western European sphere of spiritual influence, generating still more theological types, some of which eradicated sacred art altogether, and condemned veneration of icons as idolatry, as worshipping created matter instead of the Creator’. What followed was the ‘loss of understanding of humanity as Created in Divine Image (icon), both Romanism and Protestantism departed from centrality of Christian theosis (deification) of Ancient Faith as the meaning and purpose of human life, thereby also forsaking orthodoxy and orthopraxis’. Greatly blessed being guided to your blog. I now have a framework that will speak to a Protestant audience – I’m afraid, to most ‘sacramental life’ smacks of Rome. I have a surprise for them though – the other way! Go East. Best I get a better understanding of orthodox theology. Icon/Divine Image and theosis/deification sound fascinating. Will definitely research western christianity’s teaching on these two orthodox teachings.